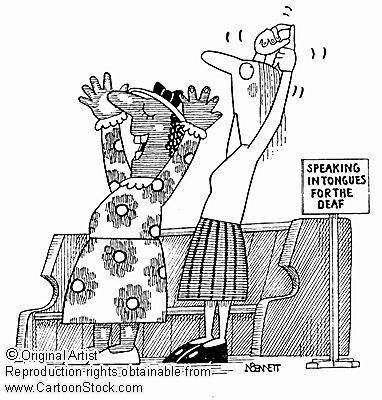 Tongues a Sign for Non-believing Jews????? I am currently attempting to dialogue with Nate B (very sharp character) over at Pulpit Magazine about the gift of tongues. My man Phil from Theology Today also had a really good discussion about this. A disclaimer is that I am open but skeptical, or open but extremely cautious, how about I am barely open and super-hyper-extremely cautious. The extreme abuse, misrepresentation of the gift, and current teaching is why. But once again the gift is biblical so I can’t deny it and the age old “when the perfect comes” doesn’t work for me. I believe that argument is at best lazy and at worst condescending as it relates to our reading and understanding the scriptures.